Smart ^^^^ Don't walk. Just look cool like Gisele Bundchen. I see her now and then and she always looks breezy. The first time was in St. Tropez and like many young women there, I wanted to touch them to see if they were real. They are. I often am amazed at what shoe designers come up with in their efforts to dazzle, and pull in female consumers. The latest trend, or yet another sneaky way to keep women on their toes is the "stiletto bootie." Could their be a more fitting oxymoron? The one above also comes with deadly studs, so could also come in handy as a weapon. But for the sake of this argument. I'm not going to be slipping that thing on when I get out of bed to make pancakes. Like all fashion trends, designers call upon celebrities to bring awareness. Here is Demi Moore at the Sundance Film Festival when the trend was just beginning. I call this the death-trap bootie. Why anyone would trudge through three feet of snow, capped with ice in stilettos is beyond me. As an aside, one year at Sundance, my dear friend Allegra Huston and I were walking down slick, snowy Main Street and as we approached an alleyway, this enormous black SUV came barreling between gift shops without stopping. God forbid he arrive late to the next trendy party. 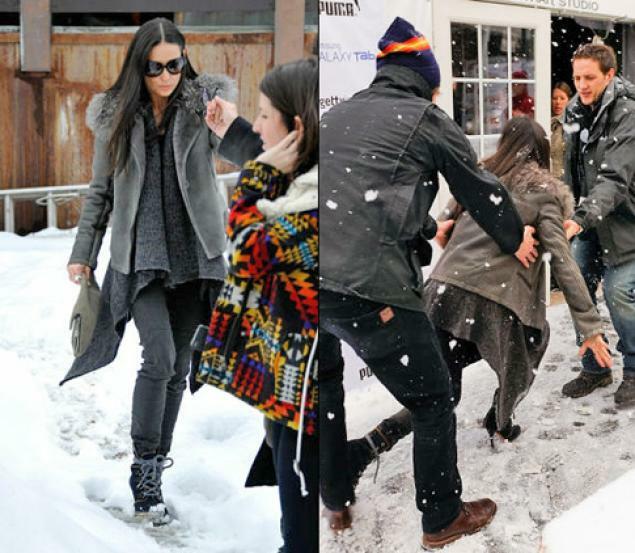 Allegra slipped and fell, right in his path. The driver had no intention of stopping, in fact he would have killed her, but that's Hollywood. I quickly grabbed Allegra by the ankles and pulled her to safety on instinct. We were both kind of shocked, but okay. Unlike Demi, not one person came to our aid, despite Allegra having done a face plant. The driver never looked back. We dusted off the snow and ice and carried on. 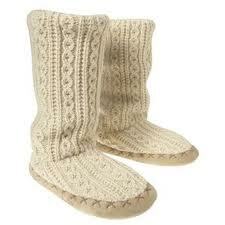 Allegra was wearing thick, rubber-soled snow boots. We were soon laughing and figured it was a kind of rapid oxygen facial. Here we have Jessica Simpson, not only wearing 5" bootie heels, but is pregnant, carrying heavy bags and walking in the middle of the street. In LA. The city with the worst drivers per capita in the nation. I suggest she at the very least cross at a light. And who can forget poor Gwyneth Paltrow at the Grammys? Not that I watched. But this borders on, well, just plain dumb. I get everybody wants to own/wear/be seen in Louboutin shoes (except possibly me) but this girl deserves some kind of Olympic prize for making it down the stairs, while singing, dancing, smiling and getting her Plume on. Let's look more closely at the Plume. It's the top of the line bootie, costs more than a small vehicle and frankly is ugly. But that's me. I get these are "works of art." But then put them in a museum behind glass. Aren't women tortured enough in this society regarding their looks? Not only does this society encourage women to get to cut up their faces, starve themselves to death and where clothes that are grossly uncomfortable, now the idea is to turn them into cripples as well. Unless the heels are serving as crampons, this company should be sued. Things will not turn out well for this girl. 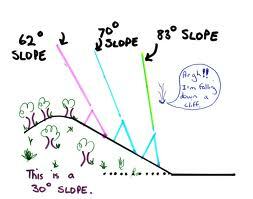 On any given occasion you can raise the slope to ground factor, then proceed. I didn't get this right until my 3rd time at a garden party. I'm standing on a steeply sloped, perfectly manicured lawn talking to oh, probably some very important people. "Rhonda, let's go over to the bar and grab a drink." So we start to wander over, but my 5" heels are stuck in the thick, moist sod. You never know this is actually happening because you don't actually feel yourself slipping into the quicksand grass. Therefore, when it comes time to actually move, your heels are firmly embedded, you are not, and falling face down ensues. It's horrifying. But once you get the ratio graph worked out, you'll be fine. These shoes of course are never made for men. This might be why. 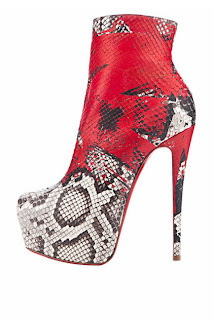 I have a theory why Stiletto Booties are so popular right now. Okay, it doesn't take a lot of brain power. Super Heroes. We are surrounded by them. They are everywhere. Movies, TV, books, board games, role-playing. (Not that I would know.) But what male designers don't seem to understand is women can barely walk in these things, let alone defend herself against Evil Avengers. So, as women, just remember, this too shall pass.